Comfortable detached villa with private pool and secluded gardens in a small village. Well-equipped and air-conditioned. First class villa with real Thai ambiance situated in rural village of Bang Nong Yai. Private pool set in tropical gardens. Very close to the nearest bar and restaurant. Luxury villa with large, private salt water pool and spa. Set on an extensive plot with superb gardens and many tropical shrubs and flowers. Beach two km, restaurants and bar within walking distance. Stunning, fully equipped, tastefully decorated 3 bed, 3 bath villa, fully air-conditioned, with swimming pool. Located in quiet village, 1.5km from Khao Kalok beach and restaurants. Experience 'real' Thailand! This well appointed villa (with private pool) is situated in the rural Thai village of Ban Nong Yai, which is 1.5km from the stunning Khao Kalok beach. Spacious villa in a beautiful, quiet area. Sunny patio and shaded terrace next to pool. Five minutes drive away from the beach, restaurants and bars with sea views, and plenty of holiday activities. Up-scale, modern and well-equipped mountain beach retreat with tranquil Thai holiday ambience. Cocktail bar, massage area, karaoke stage and outside dining area in tropical gardens with large pool. Palm Island villa offers exclusive self-catering accommodation on the north west coast of Koh Chang,in the province of Trat. 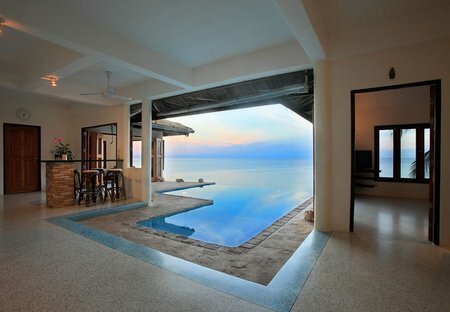 Our emphasis has been to design a new Koh Chang villa beach house.